Carpets are bound to gather a lot of dust and dirt depending on the traffic. Some areas, especially households where there are toddlers, present also means that there is going to be more frequent spills and dropping of food particles on the carpet. Such areas require regular cleaning. Ideally, a carpet should be cleaned regularly and vacuumed at least once a week. Carpet Cleaning is very crucial for healthy living. The dirt that carpets gather can cause serious health complications. Spills and moisture on carpets can cause mould and mildew to form on the carpet too. Unclean carpets are an unbearable sight especially if they have been stained. Carpet Cleaning London involves removal of dirt and dust through vacuuming. Advanced cleaning for removal of stains usually involves more than just the usual vacuuming, and stain removal such as spilled wine, coffee may require the use of chemical cleaning agents that will remove the stain without causing any critical damage to the colour and fibres of your carpet. Most professional cleaners have all the advanced tools for Carpet Cleaners and are able to determine the right kind of agents to use depending on the fibres your carpet is made from and the type of decoration it has on it. When trying to remove stains, it is advisable that any powerful or advanced detergent that you choose is tested on the most inconspicuous parts of your carpet especially under furniture and any other place that cannot be easily spotted. This way you can tell whether the cleaning agents you intend to use are safe enough for your carpet. Apart from the regular cleaning when doing the occasional thorough cleaning, special attention should be paid to certain areas such as around radiators and base boards since these are the hard to reach areas that normally gather dirt and are never reached during the normal regular cleaning. Remember, in order to get the best results with any type of cleaning, taking your time not only ensures you get the best and cleanest carpet, but also ensures that your Carpet Cleaning process is not too aggressive and damaging to your carpet’s fibres. In fact, it is helpful to divide your carpet into quadrants that you can then pay attention to each of them as you go about your cleaning. Some of the places that will gather the most dirt are those places where people sit around chairs. Paying attention to such places is crucial. 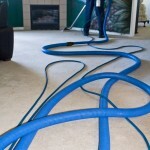 If your Carpet Cleaning involves the use of water, ensure that your carpet dries completely since dampness can bring about growth of mould and mildew, which at times may have very harmful spores that can cause respiratory complications and initiate attacks on people with allergies and asthmatic conditions. Professional carpet cleaners tend to use carpet cleaners that are able to scrub your carpet with very little wetting, which ensures the carpet is able to dry fast. Floor rugs should be hung out in the sun where possible in order to dry the completely. These are just some of the basics of Carpet Cleaning that can ensure you have a clean looking carpet.